Heat 2 teaspoons oil in large sauté pan over medium-high heat and add chicken. Sprinkle liberally with salt & pepper, cook and stir until cooked through, about 5 minutes. Remove chicken to a (foil-lined) bowl and set aside. In the same pan, cook and stir asparagus in 1 teaspoon oil until soft, about 3 minutes. Add to chicken in bowl. In a small bowl, whisk milk & flour until smooth and place in the same pan. Add Parmesan, salt & pepper. Bring to a boil, reduce heat, cook & stir until thickened, about 2 minutes. Remove pan from heat. Stir in cooked & drained bow ties, followed by chicken and asparagus with any juices that remain. Notes: If using broccoli, add a few tablespoons of pasta water to the broccoli while you sauté it. 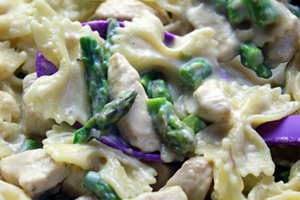 9 Comments on "Creamy Chicken Asparagus Bow Ties"
Love your recipes!!! You’ve inspired me to develop a passion for healthy home cooking! Quick question… I work odd hours of the day. As a result, I make several meals at once and then freeze them for the week. Would this meal be okay to freeze? When it comes time to unfreeze, how long should it be and what temperature? Thanks!!! I’m sorry I don’t like to advise on something I have never done. I have never frozen this dish but there is lots of information online about freezing. I’m just not sure how the texture would be after freezing. 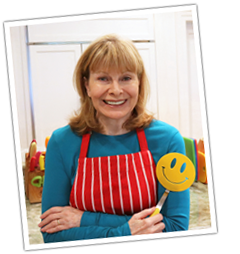 We came across your site quite by accident and now we can’t get enough of your wonderful approach to cooking! We’ve already made some rolls and they are soooooooooooooooooooo good!!! I don’t have an account. Where do I sign in and how can I print the recipe? No account. No sign in. Everything here is free and no ads. Just click the “print’ button at the top of the recipe. Would s 10.25″ skillet be large enough for this recipe? It’s large enough as long as it has tall enough sides. Mine is 9 inches across and 2 1/2 inches tall. Thanks for such a good, low fat, recipe. We loved it.